Google is pitching its Project Glass eyewear as the next step for mobile photography, and has shown off a bunch of new photos to prove it. Max Braun, a tech lead on Project Glass, took the stage at the company's Google+ Photographer's Conference this week to talk about how the augmented reality glasses could change photography. In several of the photos, the user's hands are occupied, which would make a traditional photo impossible. In others, the user is in the middle of an activity--such as running or reading a newspaper—where a handheld camera is inconvenient. Braun also pointed out that the prototype's camera has a wide angle, which attempts to mimic the user's actual point of view. “We think that photography in Glass is going to open up a whole range of pictures that would not have been possible otherwise,” Braun said. It's unclear exactly how the photo-taking mechanism works in Project Glass, but in a recent interview with Charlie Rose, Google X boss Sebastian Thrun tapped the side of his glasses, which appeared to initialize the camera. Given that some of Google's example photos were taken while the user's hands are occupied, the device may have a hands-free mechanism as well. Google co-founder Sergey Brin echoed Braun's comments when he took the stage at the conference. “I think that this can bring about a really new style, new kind of photography that allows you to be much more intimate with the world you are capturing, and doesn't take you away from it,” Brin said. He also stressed that the prototypes that Googlers are testing “rough off the lab floor,” and are not even considered alpha or beta devices. 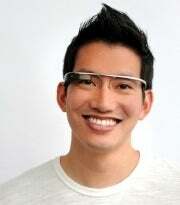 Google announced Project Glass in April, after months of rumors. The company has shown off a concept video of what augmented reality glasses might do some day, but the first product likely won't be as slick or have as many features. Google has not yet announced pricing or a release date for Project Glass.